For a healthy & strong immune system! Our dog immune system booster is critical for health because dogs are becoming overwhelmed by toxic substances, which eventually starts depleting their sensitive immune systems. For a real dog immune system booster must gently remove these toxic elements from your dogs body. Feeds 10 Billion CFU Probiotics P/Serving! 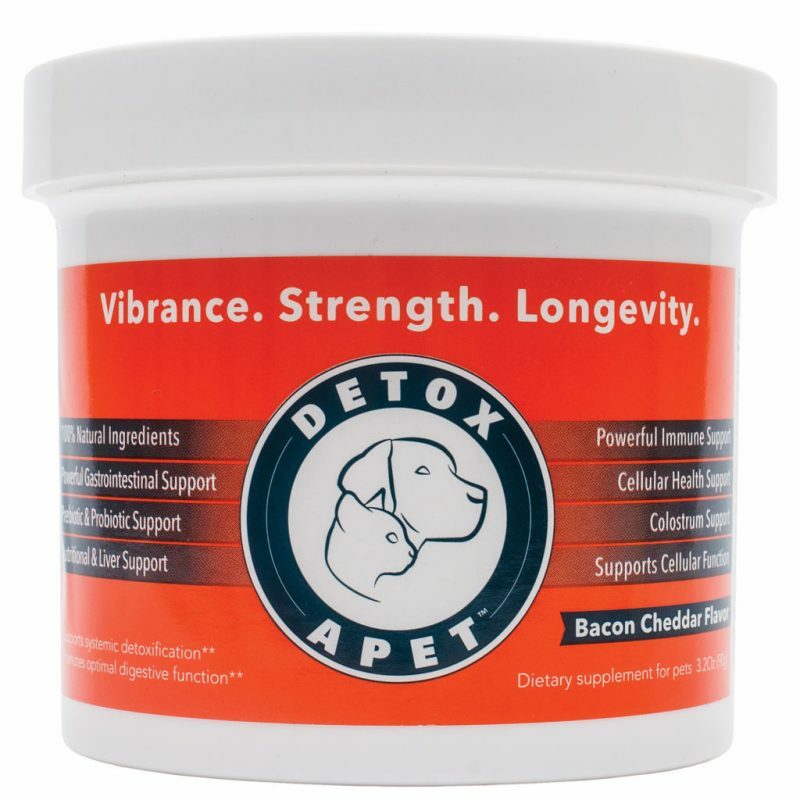 Mix Detoxa-Pet Into Your Pets Food & Watch Them Thrive! 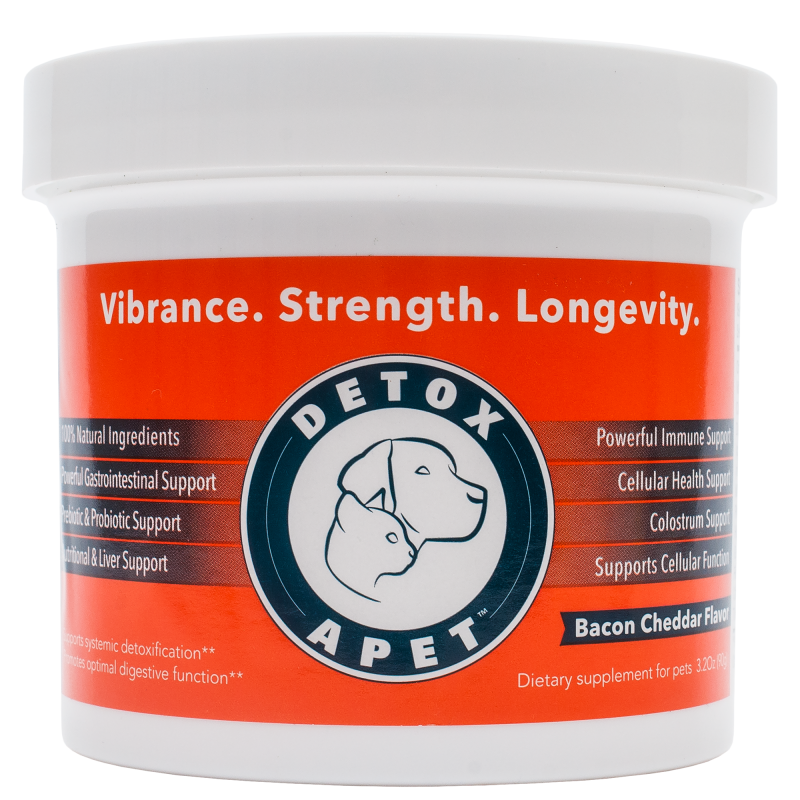 Each scoop of Detoxa-Pet contains powerful; fast acting ingredients. Powerful natural ingredients like Colostrum, Spirulina, ProDura® Probiotics, Special Herbs, Minerals, Vitamins, Antioxidants and more. What happens is that over time, toxins start to build up within the soft tissues, until at some these substances start to overwhelm your dogs immune system, making it much more susceptible to disease. The road to your furry friends strong and lasting health is not found in just one simple ingredient, the solution is found in the right wholistic therapy approach. Detoxapet is It is a complete and wholistic pet health formula which introduces organic spirulina along with Important vitamins, minerals, antioxidants, probiotics, colostrum, enzymes, herbs, phytonutrients, trace minerals, flax, prebiotics and special fibers – It’s packed with amazing healing and growth factors that is the best dog immune system booster available. Did you know that within your pet lives a lot of bacteria? Most of this bacteria is living within its intestinal tract- better known as the gut. One of the most important aspects of the right supplement is making the intestinal tract strong and in good shape, because as you’ll find, the health of the intestinal tract is linked directly to the health of the immune system and health performance. The health of the intestinal bacteria is essential in maintaining your pet’s strong immune system for years to come. Importantly 80% of the immune system is contained mainly within the gut. Also, the gut bacteria health and the immune systems health are linked together. If the bacteria in the gut are in balance, the immune system is balanced and strong. But when the intestinal bacteria are weak and out of balance, so is the immune system out of balance. These protective healthy microbes can be depleted by today’s by diet and toxicity, causing imbalances in the gut, weakening the immune system. 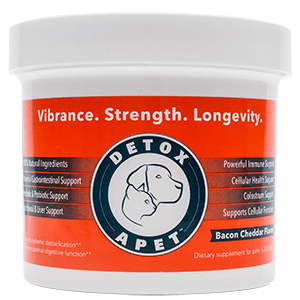 Detoxapet’s deals directly with the toxic elements the intestinal tract continually produces. Friendly and essential bacteria protect against most of these toxins, which is a normal process, but there needs to be a healthy level of good bacteria to protect your pet to perform. These are attacks by toxins substances and pathogens which pets are exposed to. But with a healthy population level of friendly bacteria in the intestinal tract, along with the necessary production of the naturally occurring prebiotics with the ingestion of probiotics you can keep your pets intestinal tract healthy and thriving. This is the best immune defense. There has been lot of research in the last 20 years, showing colostrum to be one of the the most important nutritional sources and health supplements to take that enhances the repair of tissues and a powerful dog immune system booster. Epithelial Growth Factor (EgF), Insulin-like Growth Factor (IgF), and Transforming Growth Factors (TGF-A & B), alpha and beta, are all in the amazing supplement Colostrum. all essential in the healing and proper motility of the intestinal tract, muscles, tissues and joint and more. It promotes natural antimicrobial activity with the Lactoferrins it contains. The regulator of the thymus gland are polyproline-rich peptides, the main immune regulator – so colostrum is one of the best immune enhancing supplements to have.